Yes, U Haul Has Work From Home Jobs! We Have All the Details. Published December 30, 2011 By Anna T. This post may contain affiliate links. Regardless, I only recommend sites I've researched and/or used and trust. U Haul work from home jobs are for real! Believe it or not, they occasionally hire people for home based sales and reservations. This is a phone job from home so you need a quiet background to work. This is basically a must. 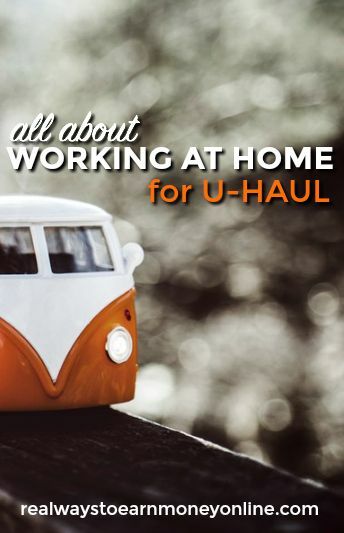 As of the date of this blog post, U Haul does appear to have work from home openings. They are hiring for home-based call center jobs, reservations agents, and hitch central agents. How much can you make with U Haul work from home jobs? According to U Haul job descriptions, with base pay and the bonus structure, you'll average around $14 to $15 per hour. However, the base pay minus bonuses is somewhere between $7.50 and $8.50 per hour (I've seen both rates quoted). You supposedly receive bonuses for booking rentals. Note that this is an employee work from home job, not independent contractor, so you're paid for training time. There are also some benefits you may end up being eligible for, like medical, dental, life, 401K and more if you are considered for a full-time, permanent position. How long does training last at U Haul? Training lasts four weeks and is paid. You also receive a bonus of $50 after you complete all four weeks of training. What type of work do you do for U Haul? You will answer questions from customers who are calling in with inquiries about U Haul products and services. Additionally, you schedule reservations from customers for U Haul trucks, storage buildings, and other equipment. To qualify for U Haul work from home jobs, you must be good with people on the phone and also fairly computer literate. A typing speed of at least 25 words per minute is required. You do not have to have prior call center experience to get this job, but it is preferred. Also, it's required that you're at least 16 years old with either a high school diploma or GED. This makes U Haul one of those rare online jobs for teens. What are the technical requirements for U Haul work from home jobs? Right now, U Haul is hiring for part-time workers. They need people who can work at least 32 hours per week and some weekends. They have several different shifts available to work on all seven days of the week. How do people like working for U Haul? I've read a lot of positive things. There are many who say that they enjoy this job because it isn't very stressful compared to other types of phone work from home and also the hours are very flexible. On the flip side, I have seen some complaints about the pay. It's fairly low unless you do get the bonuses. You can visit this link to apply to search for current work from home sales and reservations agent plus roadside assistance jobs for U Haul. Yes, Actually my brother work’s for. U-haul corporate office in phx, Az. I’m a little confused on the internet connection you need. I have a modem that allows me to have wireless access to my internet. Is that completely different than a cable internet? Could I just hook an Ethernet cable up to my modem and qualify then or do I need a completely different internet plan in order to be approved for a position? Hi what are the training hours like? I know it’s weeks but what hours for training? I have applied and haven’t heard back. Is there a number I can call ? I’ve just recently (13th of Feb) been hired, and thus far, I must say the training seems pretty straight forward. The pay is $10 an hour (center sales remote agent) plus bonus for every reservation you make. I’m not located in AZ, but that was not an issue. The hiring process seems fairly easy. You put in your application, I received a call ( maybe a week later, though in the past it did take little longer) they sent some info to my email that needed to be returned (speedtest) and if that work, they setup a time for an phone interview, (the interview did not take long, (20mins or so) than, was told they will contact me within an hour with an answer of whether I was hire or not. So, received the call within 30mins, and was hired. You are required to do a drug, background test and I9 form to be signed by a U haul GM (locally)…and from there everything is history. Good luck to everyone, this job so far, seem to have a laid back feeling to it…. I have a phone interview coming up and I read online that they don’t allow you to use Intel for a processor.. I didn’t read that at first.. so they only allow core i3 or better to work? What’s the recruiters phone number? Hi Guys can anyone tell me how is the training? I go to school twice a week mid afternoon do you think they’ll work with me on that? are they flexible with their training hours? What questions did they ask at your interview?is all the position paying $10?is the position part time or temporary?thanks! Yes from my last post you all are correct , it does say training from home now .. I have been in communication with a recruiter today and they are hiring. $8.25/hr plus bonuses. Mon-Fri 12pm-8pm CT and Saturday and Sun 6am-6pm CT. Training in through webinars. I am excited for this opportunity! Thank you for this post! I think it may depend on the position they are hiring for. There are many people who have worked at home for U-Haul that live outside of AZ, in other parts of the US. They have several different work at home positions open at different times, so keep checking back if what they have now requires AZ training. They are hiring right now and offering $8.50 an hour, plus monthly bonuses. However, be sure to test your computer speed as they suggest on the site. My download speed did not meet their requirements, and they will not hire you if you can’t meet their speed. I’m disappointed as i was looking forward to the job. BTW, they have an orientation on 10/29 and training start 11/4 so get your apps in soon. Hello I just applied here as a work at home sales agent. I do have another job so I am looking to do this only part time. I already have a home office set up so I should easily qualify and type about 60 wpm. It is really nice they have VOIP as I do not have a land line. I have to stagger the hours for when I do not have my kids..is that possible? I really only want about 20-25 hours a week but am open to working mainly after noons and nights and some weekends. Any feedback is appreciated. Thank you. I apply on their site all the time and never hear back. They told me I’m in the right place. I work for UHaul.. right now they’re hiring like crazy… but, the hours you work are not very good. I know sales reps that are working less than 10 hours a week.. some do get more.. but, now many. A lot of folks are getting second jobs. How does scheduling work? Is it done weekly/monthly? Is the call center open 24/7? I’ve heard, on the work-at-home mom message boards, that U-Haul is a great place to work! The pay is on the low end, but it seems like a pleasant experience to work for them.